Attempted crossings steadily rose following zero-tolerance policy. U.S. border authorities are predicting the number of undocumented migrants stopped at the southern border could reach as high as 1 million by the end of the year, potentially doubling last year's level, federal officials told ABC News on Tuesday. The estimate, which includes illegal crossings and people arriving at ports of entry, comes as administration officials say they have limited options when it comes to deterring families traveling with children. The influx has gotten so bad at places like El Paso, Texas, that the central processing center there was 395 percent over capacity last weekend, forcing officials to process people beneath a street overpass. "The numbers are trending from bad to worse, which is why we need Congress to act to fix outdated laws to address migrant flows," Homeland Security Secretary Kirstjen Nielsen tweeted Tuesday. Nielsen met with government officials from Mexico Tuesday and was planning a trip to Honduras to meet with foreign leaders there this week. Kevin McAleenan, head of the U.S. Customs and Border Protection, canceled his testimony before Congress on Wednesday to travel to the Texas-Mexico border, a congressional staffer said. Federal officials told ABC News they predict there will be some 95,000 attempted crossings in March and possibly 100,000 in April. That would put attempted crossings at more than half a million -- about the same number as in the entire 2018 budget year -- with several months to go. The officials spoke on condition of anonymity because the numbers have not been publicly released. The 1 million estimate reflects a complex humanitarian crisis at the border and political headache for President Donald Trump, who staked his candidacy on curbing migration to the U.S. But it wouldn't be a record high. In 2000, the U.S. apprehended 1.6 million people trying to cross illegally between ports. That figure, however, does not include the number of undocumented migrants arriving at ports, referred to by the government as "inadmissible." Most of those people are there to claim asylum. 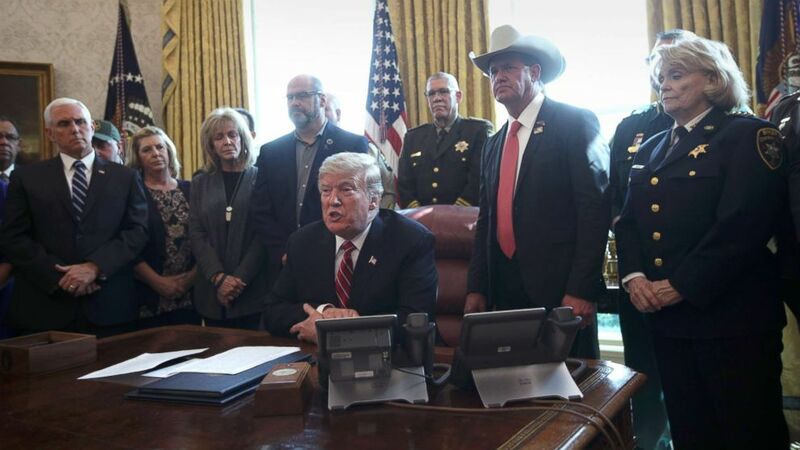 (Alex Wong/Getty Images) President Donald Trump speaks on border security in the Oval Office of the White House March 15, 2019. Still, officials say the arrivals are no longer men from Mexico looking for work, but rather families fleeing poverty and violence in Central America. That complicates how border authorities have operated, now having to care for children. The influx raises questions about whether the administration may have inadvertently encouraged migrants to travel to the U.S. by pursuing and then backtracking on a zero-tolerance policy. That policy resulted in thousands of children separated from their parents. But after the practice of family separations collapsed amid public backlash and a federal judge's order to reunite the families, the number of families arriving at the border steadily began to increase. (Obtained by ABC News) Migrants are seen lined up in El Paso, Texas, on March 23, 2019, after crossing the international border between the United States and Mexico and surrendering to a border patrol agent. Since then, administration officials have spoken at lengthy publicly on the limited options the U.S. has to detain migrants who arrive with their children. A 1997 court agreement mandates that children not be held for more than 20 days. 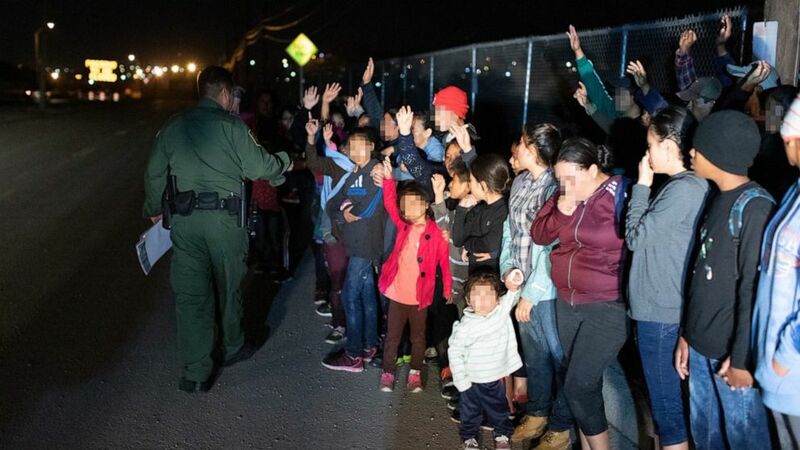 Last week, U.S. Customs and Border Protection said it planned to start releasing some families apprehended near the border in south Texas as detention centers fill to capacity. Some of the families apprehended in the Rio Grande Valley area would be given notices to appear in court. Others will be released on their own recognizance, meaning they have a court date but no set bond amount.